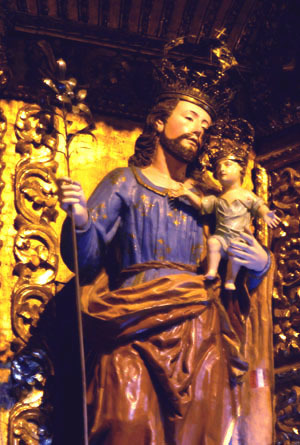 My daughter, although you have described my spouse, Saint Joseph, as the most noble among the Princes and Saints of the heavenly Jerusalem, still you cannot properly manifest his eminent sanctity, nor can any mortal know it fully before he arrives at the vision of the Divinity. Then all will be filled with wonder and praise as the Lord will make them capable of understanding this truth. On the last day, when all men shall be judged, the damned will bitterly bewail their sins, which prevented them from appreciating this powerful means of salvation and availing themselves, as they easily could have, of this intercessor to gain the friendship of the Just Judge. The whole human race has much undervalued the privileges and prerogatives conceded to my blessed spouse and they do not realize what his intercession with God is able to do. I assure you, my dear child, that he is a greatly favored personage in the divine presence and has immense power to stay the arms of the divine vengeance. I desire that you be very thankful to Divine Goodness for vouchsafing you so much light and knowledge regarding this mystery, and also for the favor which I am making you by revealing this. From now on, during the rest of your mortal life, see that you advance in devotion and in hearty love for my spouse, and that you thank the Lord for having thus favored him with such high privileges and for having given me such great joy in the knowledge of all his excellences. In all your necessities you must avail yourself of his intercession. You should encourage many to venerate him and see that your own religious daughters distinguish themselves in their devotion to him. Whatever my spouse asks of the Lord in Heaven is granted upon the earth, and on his intercession depend many and extraordinary favors for men, if they do not make themselves unworthy of receiving them. All these privileges were to be a reward for the amiable perfection of this wonderful Saint and for his great virtues; for the divine clemency is favorably drawn forth by them and looks upon Saint Joseph with generous liberality, ready to shower down its marvelous mercies upon all those who avail themselves of his intercession.